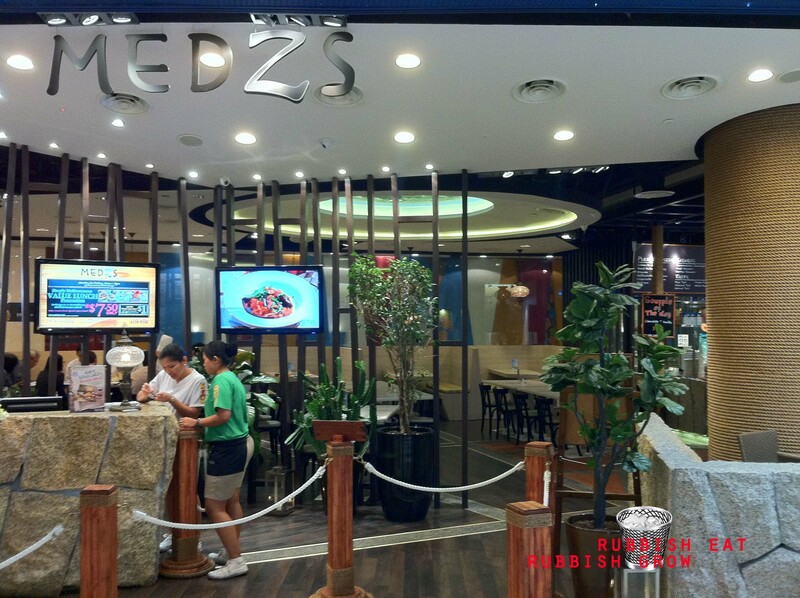 Medzs serves a good selection of Mediterranean food and the setting is cozy and intimate with dim yellow lighting. A Marche-style of ordering. You get a card, find a table, go order. They give you a beeper and when your food is ready, the beeper rings and you go collect it. So much more civilized than queuing. The roast chicken ($10), a French dish, served by a hot pinoy young chef, Francis, was amazing. I’m talking about the chicken, not Francis. Tender and smooth–still talking about the chicken here!–and steaming hot. The sauce was a bit on the bland side but that’s how French food is, a very bucolic feel. You can add salt but I liked the sauce as it was, very subtle and simple and homecooked. Sat in front of the dessert section and saw the dessert chefs making the cakes in front of my eyes. A lady chef was carrying a gigantic silver pot of mixture and pouring it on the baking pan–wow. I don’t even think I have the muscles to do that. RESPECT. My respect for her means that I just had had had to order the chocolate souffle ($6.80) which comes with ice cream and vanilla sauce by the side. This has got to be better than Pave Chocolate and Laurent’s Cafe. Granted that the ingredients that are used are inferior than Pave’s and Laurent’s, this is democratically priced at $6.80 compared to their ridiculously priced $20 souffles. Furthermore, the way it was handled was so much better. 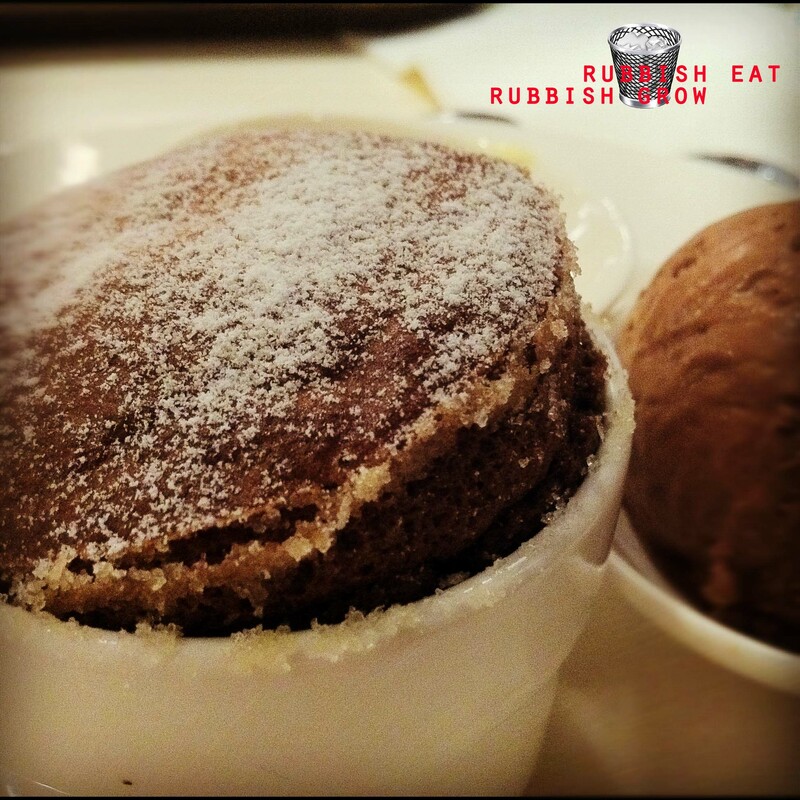 There were no sugar grains at the bottom of the souffle, only at the edges of the bowl. The souffle rose more naturally, as compared to the other two, and can actually deflated within 2 minutes. The taste was superior in the sense that the sugar powder on top didn’t dry out the tongue, which Pave’s did. The vanilla sauce by the side allows you to customize your own taste. However,the chocolate ice cream didn’t quite compliment the already chocolate souffle and it was slightly over baked. But I think the biggest plus point is that: although it wasn’t chocolatey enough, it wasn’t overly sweet either which gave it a very homecooked feel. I think it helps that the young male pastry chef was sprinkling the sugar powder so dedicatedly over the souffle. I really wish these two chefs–the male and female–go far. I want to compliment these two chefs, well done! Your efforts are appreciated! Although there wasn’t any servers, the people I came across were all friendly and polite. Mr NGFL would call Medzs a “glorified kopitiam” but I think it’s more a “boutique canteen.” The difference is a “glorified kopitiam” is pretentious and overselling while “boutique canteen” is an unassuming value-for-money place where you can get good food. This place left an excellent impression on me all round, food, people, ambience. The only negative point is when I paid, the bill was rounded up (to the nearest 5 cents) when the usual practice is to round down. Come on, how much can the company lose if they round down? Just tried the chocolate souffle yesterday, and it was so so good. It’s a daily special and it’s not listed on the menu, but you can request for it. It’s like a hidden gem! French Food Bland; I would have to disagree, the sauces in the French Food station in Medzs are a little bland I agree, but the French have produced some of the finest epicurean sauces known.